Polyjacking is the most innovative and effective process for repairing your commercial concrete issues. The high-density polyurethane concrete leveling process is known as the best solution for concrete repair, leveling, and lifting. PolyMagic specializes in commercial and business locations with little to no down time! Check out some of the below benefits of polyjacking your commercial location. Cost Effective – Concrete raising is typically about 33% less than replacing the same concrete at your commercial location. Ultimately, the cost of raising or stabilizing concrete is a direct reflection of how much leveling material the project will require. 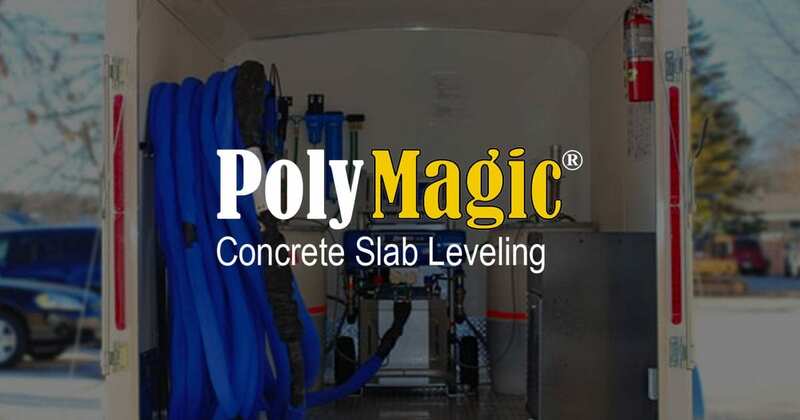 The experienced team at PolyMagic is equipped to offer a free estimate and walk you through each step of the process for the most cost effective solution that fits your needs. Time – Polyjacking has very little ‘rest’ time. Your business and commercial area is able to continue operation before, during and after the polyjacking process. Your business will experience little to no down time. Clean Work Environment – The polyjacking process does not require a wash down and will not have any concrete or grout splatter. The area is clean and can operate as normal immediately after. Smaller Holes – Polyurethane concrete raising drills a nearly invisible 5/8 inch hole and the process calls for considerably fewer holes than traditional mudjacking. The tiny holes require very minimal patchwork. Lightweight – This material will never lose density. It is permanent and weighs only about 2 pounds per cubic foot. Compared to traditional mudjacking that weighs about 100 pounds per cubic foot.Check out the below comparison in the amount of product needed for mudjacking vs. polyjacking. When exploring the repair process for your commercial concrete problem areas, it’s important that you find a company that is knowledgeable, trustworthy, and experienced. PolyMagic has over 35 5-star Google Reviews, and is happy to present a list of references. Get started today with our online quoter form!